Gail shares on managing eczema and allergy for her baby and teenage daughter, and oh, they look so lovely! This is a series focused on a personal journey with eczema while managing a certain aspect of life. Today, we have Gail, who shares about managing eczema for her baby and nut allergy for her older daughter. Gail has spent much time looking for products to help families with eczema, and has it all under one roof at her store, Everything for Eczema. Marcie Mom: Hi Gail, it’s good to have you share in this series! Let’s start with you sharing a little of your older daughter’s nut allergy and the extent of care that is required. Gail: Hi Mei. My older daughter, Charlie, was diagnosed with a nut and seed allergy when she was 3 and she’s now 14. The biggest challenges now that she is a teenager are that she hates carrying her epi-pens around with her as she feels they make her seem different to everyone else. She will frequently take them out of her bag before she goes to school or out with friends. Now that she eats out more without me, it’s also a worry as she is very self-conscious about asking whether there are nuts or seeds in a meal. Marcie Mom: What about care for the younger baby? When did the eczema start and was the scratching intensive? 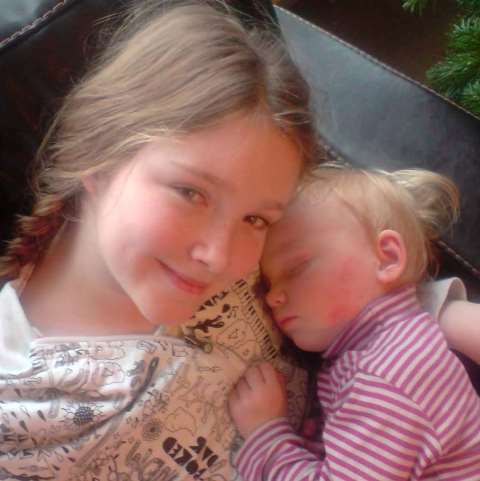 Gail: My younger daughter’s eczema started when she was just 6 weeks old. Within a couple of months the whole of her body was covered in eczema and she often needed to have her legs and arms bandaged. Tallulah was incredibly itchy and would scratch until she bled if left alone for more than a few seconds. Bath times and nappy changing times were incredibly stressful as this was when she could get at her skin and scratch uncontrollably. Marcie Mom: How did you manage bedtime for all of your children? What was the most difficult part? Gail: Bedtime was one of the worst times of the day. Tiredness would always make Tallulah extra itchy and she would need lots of attention. This would have a knock on effect on Charlie who would start to feel left out. It probably didn’t help that I was very sleep deprived too! Marcie Mom: One final question – was there a turning point during this period which made it easier for your family to manage eczema and allergies for your children? Gail: Establishing a good bedtime routine really helped. When my little one was tucked up in bed I would then spend some quiet time with my older daughter so that she felt special too. Finally getting some sleep was a turning point for us all. Suddenly you start to feel human again! Marcie Mom: Thank you Gail for your sharing, it is truly not easy to manage all of it and we keep our fingers crossed that night time will get better for all families with eczema kids!